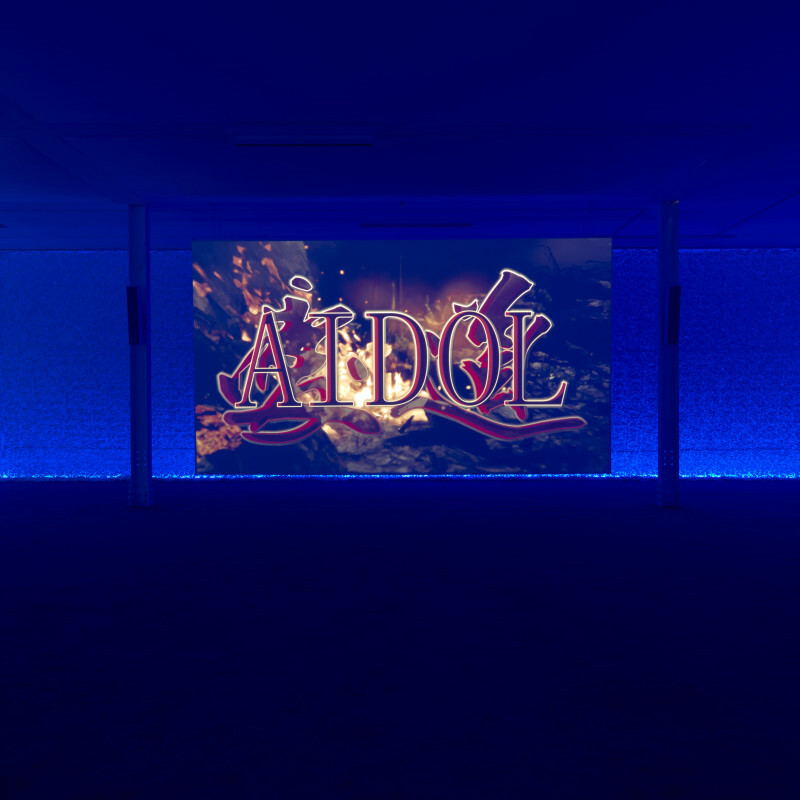 In his first exhibition at Sadie Coles HQ, Lawrence Lek presents AIDOL, a new feature-length film. Featuring a score written and orchestrated by the artist, this computer-generated fantasy tells the story of a fading superstar, Diva, who enlists an aspiring AI songwriter to mount a comeback performance at the 2065 eSports Olympic finale. Set in a smoke-and-mirrors realm of fantastical architecture, sentient drones and snow-deluged jungles, AIDOL revolves around the long and complex struggle between humanity and Artificial Intelligence. Fame - in all its allure and emptiness - is set against the bigger contradictions of a post-AI world, a world where originality is sometimes no more than an algorithmic trick and where machines have the capacity for love and suffering. Produced using 3D rendering, gaming software and motion capture technology, AIDOL is the sequel to Lek's 2017 film Geomancer. It builds on a sequence of CGI creations in which he draws upon the language of videogames, science fiction, music videos and corporate animations, among multiple other sources. The result is a shifting and seductive virtual reality, punctuated by Diva's songs and an evolving soundtrack of electronic themes. In its multiplicity of references, AIDOL defies the concept of genre, engendering a fictional space that is alternately recognisable and alien. Both in setting and action, the story shifts between stylistic convention and uncanny beauty, as much as between real-world allusions and dazzling inventions (or both, as in the case of Diva's hit song Deep Blue Monday, whose title refers to the 1990s computer that was a pioneering instance of AI - the first machine to beat a reigning world champion at chess). Aspects of modern South-East Asia - from megabrands to super-casinos to cultural persecution and underground resistance - are allegorized into a futuristic otherworld. As in Lek's previous works, Farsight Corporation is a controlling force in this universe. The global conglomerate, with its ubiquitous logo and vast temple-like headquarters, usurps the role and status of a political regime. The event of Diva's comeback is an international tournament sponsored by Farsight - the eSports Olympics - staged in an airborne stadium whose shape mimics the company logo, and in which 'Bios' are pitted against 'Synths'. This contest belies a more profound existential conflict between humanity and machines, a conflict which finds transient resolution in the meeting between Diva and the AI artist Geomancer. As in previous works by Lek, the focus of AIDOL is both forwards and inwards - glancing dually at the future and the present. Contemporary anxieties and fixations - the rise of AI, the formulaic dictates of celebrity, the hegemony of global brands and technological giants - are refracted through a quixotic prism. Lek's imaginary sphere may be read both as a shimmering utopia and as an automated, profit-driven and algorithm-propelled dystopia. Throughout, the dichotomy of 'human' and 'AI' is tested and dismantled. Far from simply reprising the narrative of humanity imperilled by machines, the story points to the rote and unthinking infatuations of human minds, and equally to the ability of conscious machines to aspire to beauty and knowledge. Lawrence Lek (b. 1982, b. Frankfurt am Main) is an artist based in London, working in fields of virtual reality and simulation. He studied at Trinity College, University of Cambridge, the Architectural Association, London, and The Cooper Union, New York. Recent exhibitions include: 2065, K11 Art Space, Hong Kong (2018); Nøtel, Stroom Den Haag, The Hague (2018); Play Station, Art Night, London (2017); The New Normal, UCCA, Beijing (2017); Glasgow International, Tramway, Glasgow (2016); SeMA Biennale Mediacity Seoul 2016, Seoul Museum of Art, Seoul (2016); Missed Connections, Julia Stoschek Collection, Düsseldorf (2016); Secret Surface, KW Institute for Contemporary Art, Berlin (2016); Software, Hard Problem, Cubitt Gallery, London (2015); and The Uncanny Valley, Wysing Arts Centre, Cambridge (2015). Lek received the 2017 Jerwood/FVU Award and the 2015 Dazed Emerging Artist Award.